The new Sonos 8.0 app update contains major UI changes that will be and is a new learning curve for Sonos users. Below are the following major changes Sonos has implemented with their newest 8.0 software release. The new Sonos 8.0 app Tab Bar now allows you to access your favorites, browse your available music services, select rooms from the dedicated tab, search your Sonos music and use the more tab to get to your Sonos system settings right from the bottom of the app all the time. The easy room control allows the Sonos user to send the now playing music to other rooms within the Sonos system by tapping the room name at the bottom of the app and then selecting either an individual room or the convenient everwhere slide button which plays the now playing music to all Sonos devices within the system. The Ring video doorbell is a great stand alone smart home doorbell to give you eyes and ears on what is happening or who is at the front of your house or entry. The night camera view as shown above has built in infrared (IR) illuminators to allow the camera to be viewable at night. You can listen to the Ring's built in microphone by pressing the audio symbol in the lower right of the app to hear what is going on around the Ring doorbell. You can also press the green talk button when in a live camera view to communicate with whomever is at your front entry. The picture above is what the Ring doorbell looks like at night with the circle light being the doorbell button. The three red lights below the illuminated doorbell button are the infrared (IR) illuminators allowing the camera to see at night. The Ring doorbell is a great device and accompanied app to help bring your home to the connected age we now live in. 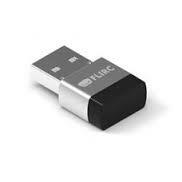 When attempting to control and integrate the Amazon Fire TV with the use of a universal control you will need the help from the Flirc USB Dongle to accomplish the task which is readily available on Amazon's Online Store. The Amazon Fire TV comes with a Bluetooth remote which is great if you do not have an involved TV setup and would like to hide the Fire TV away out of viewing site but it does not help if you are trying to have one system and remote control to work all your devices seamlessly. This is where integrating the Fire TV using the Flirc USB comes into play. Below is the current list of Amazon Alexa Smart Home Skills integratable with your Amazon Echo as of May 28th, 2017 in order by current release date. Adobe Smart Home by adobe systems, inc.
iSmartAlarm by iSmart Alarm, Inc.
mimoodz by Smart Gator Labs Inc.
To wire Crestron Cresnet properly you are suggested to use Crestron's standard Cresnet cabling which consists of 4 conductors to operate correctly. You will need a small flat head screw driver called a tweeker to unscrew the 4 small screws of the green phoenix connector to be able to insert your stripped back wire ends. The red wire is for the power of the Cresnet communication bus which is 24VAC. The white wire is the Y communication of the RS-485 bus which is the positive side of communication pair. The blue wire is the Z communication of the RS-485 bus and this is the negative side of the bus pair. Finally the black wire is the ground side of the power pair to complete the Cresnet connections and wiring. 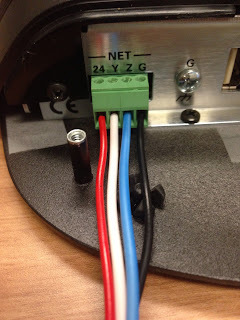 Once the wires are inserted into the Pheonix connector you will use your tweeker screw driver to fasten the wire to the phoenix connector as seen below in the picture to be able to connect whichever device you are hooking up. The Ring Video Doorbell is advancing forward with the new software updates and features now available that help make it more reliable and less of an annoyance with false motion alerts. See below to help in setting up your Ring device. 1. Open the Ring app and press the gear icon settings button located in the top right hand corner of the application. 2. Press the Motion settings button as seen above to access the Ring's motion settings.